Last Sunday, I took a break from the monsoon rains and sought refuge at Jimmy’s Italian restaurant where a book launch was being held in the somehow-always-busy town of Mcleod Ganj. The launch was for a friend and guest contributor of Lhakar Diaries, Bhuchung D. Sonam, whose latest work, Yak Horns: Notes on Contemporary Tibetan Writing, Music, Film & Politics was recently published by TibetWrites. Yak Horns is a collection of writings on contemporary issues relating to Tibet, narrowing in on little known books, films and other work by Tibetan writers, scholars and artists. 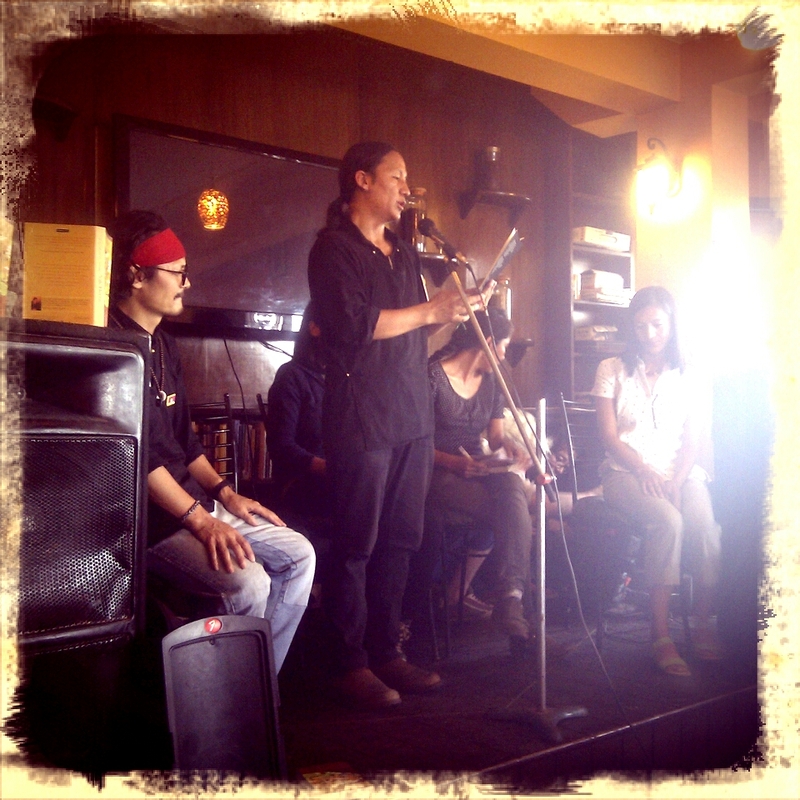 There was also a reading with other writers at the launch, Bhuchung reading his own work and three others who shared highlights of their work, Tenzin Tsundue, Tsering Wangmo Dhompa and Tenzin Dickyi. The event was moderated by Dechen Pemba of High Peaks Pure Earth who invited the writers to talk about their work more intimately and asked each of them to answer questions and share stories about themselves in relation to their work. It was great to see these writers assembling this late Sunday afternoon, squeezing in to sit together on the tiny stage at the end of a crowded Italian restaurant in Mcleod, watching members of the community shuffle in, sit down, order some pizza and listen in as others discreetly buy books on the other side of the room. It was an exciting and relaxed event that allowed us to get to know these four incredible writers a little bit more, with the added bonus of hearing some pretty sweet poetry by some of my favorite Tibetan writers. Bhuchung shared a story with the audience about the origin of the title of his book, saying that it was very much a part of his experience growing up in Tibet. He explained that it was as much a reminder of home as it was a reminder of the Tibetan voice which is often missing in our own narrative about Tibet and it’s diaspora. Since the weekend I’ve just started reading Yak Horns, but I was already struck on the very first page reading Bhuchung’s conclusion after a Western’s writer’s account of the first self-immolation as a form of protest by Thupten Ngodup in 1998. He said that “Tibetans have, perhaps unwittingly, placed themselves in – allowing outsiders to control not only our narrative, but also claiming ownership over many aspects of our lives.” He ends his introduction by saying, “Tibetans need to take control of their own narratives. We need to articulate our reality in a model that appropriately reflects our daily experiences as a people living under occupation and as refugees.” It was a point I could not agree more with but also found it sad that it even needs to be said at all. Which is why I thought this post would be appropriate for Lhakar, because he is right. Tibetans need to provide more of their own narratives and lucky for me I got to witness an afternoon full of them. Tenzin Dickyi, who also has her own blog, Yuthok Lane, recently posted her own thoughts about the event, and shared her first impressions of Yak Horns. I have been picking at the book but haven’t yet had the time to really sit down with it, but it has got a gorgeous cover and just looks beautiful, and I was hooked with the opening piece “Exile is a Lonely Pen”, an essay on exile and writing.. The book is primarily a collection of criticism– criticism being the one really important thing that’s been almost entirely lacking in our modern literature. Has anything been created until it’s been reviewed? So the talented Bhuchung D Sonam is doing Tibetans a great service, and as a friend as well as a fan, it’s great to see BDS the critic as well as BDS the writer get official between the covers. I can’t wait to sit down and properly read Yak Horns front to back. It’s always inspiring to hear other’s work so now I’ll have some catching up to do with my summer reading checking out the latest works of all of the writers who participated that day. Hope you’ll be able to find a copy of Yak Horns near you, or maybe start bugging TibetWrites to start making e-books for people to enjoy all over the world! Is this book entirely new writing or a collection of his past writings? If it’s the latter, then, all the power to u BDS. I mean if it’s the former.